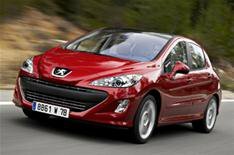 First drive: Peugeot 308 GT | What Car? If the letters G and T make you think of a cooling drink rather than a hot hatchback, you probably won't see the appeal of the latest fast Peugeot. However, if a chic French hatchback with some extra fizz sounds refreshing, the 308 GT might be just the tonic you're after. The extra sparkle comes from the same turbocharged 1.6-litre petrol engine found in the 207 GTI. This effervescent engine serves up 175bhp, helped with a large does of low-down pulling power. Okay, the performance isn't quite of the 40-per-cent-proof variety you expect from a hot hatch - the 0-62mph dash happens in 8.3sec. However, it's still got enough of a kick to give you the giggles, because it's responsive and eager to rev. It's a shame the handling isn't quite so intoxicating. The 308's suspension has been lowered and stiffened for the GT, which means terrific grip and solid body control. Hit a bump mid-corner, though, and you feel shockwaves shooting through the car. The same bumps ricochet viciously through the steering, even though it offers you little feedback. The ride is bone-jarring, too. Still, at least you won't need beer-goggles to find your GT attractive. A lowered front bumper gives the nose an aggressive look, while a rear spoiler, 18-inch alloys, bi-xenon headlamps and lowered ride height complete the sporty effect. Inside, you'll find aluminium finishes on the pedals and gearstick to give the plushly trimmed cabin a sportier feel. At £18,995 for the three-door and £19,595 for the five, the GT certainly isn't cheap. However, your cash buys you goodies such as dual-zone climate control, Bluetooth phone connection, stability control and parking sensors.